At Rowell’s Services, we are your home electrical experts! We are equipped to handle any electrical project, and we can do so safely and without putting your home at risk. Trying to tackle a project involving electricity on your own is extremely dangerous. In addition to potential electric shock, working on your home’s electrical system without the proper knowledge and supplies could pose a serious fire hazard. The safe and affordable electrical installation and repair in the Northfield, New Hampshire area, you can depend on the expert electricians right here at Rowell’s Services. At Rowell’s Services, we hire and train only the best electrical technicians in the area. 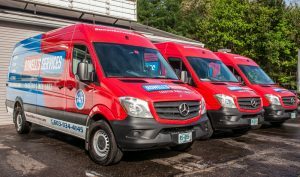 We make sure they are equipped to deliver top-quality electrical services to homeowners in Northfield, New Hampshire and throughout the region. We believe in adhering to the highest standards of quality and customer service, and give all customers the attention they deserve. Whether you hire us for a simple outlet replacement or ceiling fan installation or a more serious project like upgrading your service panel or rewiring your entire home, we will treat you and your home with the utmost respect and complete the job to the highest quality and safety standards. When you need help from a trusted Northfield electrician, look no further than Rowell’s Services. Our electricians are highly trained home electrical experts, and you can depend on them to provide honest, affordable service. To schedule an appointment, please call 603-934-4145.